"Football game with a variety of plays and league levels"
Languages: Dutch, English, French, German, Italian, Japanese, Korean, Portuguese, Russian, Spanish, Turkish. Developer: PIKPOK	- Reputable developer. Installation requirements: A minimum of 18.00 MB of free memory space and Android 2.3 or higher. Appealing to children, teenagers as well as adults. Very simple and entertaining game. It occupies a significant part of memory space. 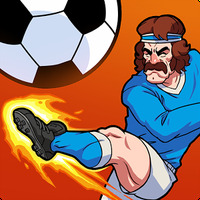 Do you like Flick Kick Football Legends?